The book 'Silvia Șerbescu - our first piano player' written by Lavinia Coman came out last year under the Grafoart Musical Publishing House in September, during the break of an event held at the Romanian Athenaeum, as part of the International Contest 'George Enescu'. Regarding the book title, I've been asking myself why Lavinia Coman thought of Silvia Șerbescu as 'our first piano player'. When the author interviewed Monica Isăcescu, we found out that 'Silvia Șerbescu had a domestic school behind. She's the first luxury product of this first Romanian piano school, founded by Constanța Erbiceanu, a piano player and a former luxury product of the Leipzig Conservatory, to whom the author has dedicated a monographic book in 2005, fondly mentioned many times throughout the book. Silvia Șerbescu's monography is pictured by the author Lavinia Coman in a chronological story of the piano player's life, framed in a wider painting of Romanian musical life and, most of all, Bucharest of the first half of the 20th century. It mostly focuses on the important moments in the piano player's career (like studying in Athens or her debut at the Romanian Athenaeum), proved by lots of newspaper excerpts from that time, mostly praises by the same few well-known critics (Romeo Alexandrescu, Simionescu-Râmniceanu, George Breazul, Miron Grindea etc.). From time to time, the author pauses her story and focuses on elements such as Silvia Șerbescu's piano technique, her repertoire, her pedagogic method. What's more, in the end, she compiles a list of all her stage appearances from her almost 40 year long career. Lavinia Coman also points out the importance of the political and ideological context, the interests that governed Romanian cultural life starting with 1920. 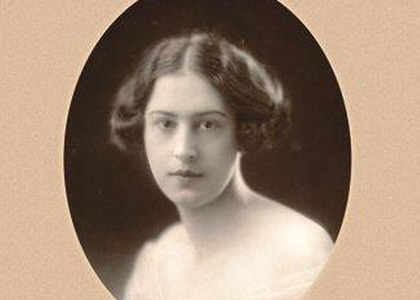 For instance, Silvia Șerbescu was appointed a teacher at Bucharest Conservatory in 1948, 17 years after her first request, and after she had been refused three times, in 1931, 1938 and 1947; in the summer of 1955, she was named the lead soloist of Bucharest's Philharmonic and, a year later, her contract was over; her recordings have been destroyed; she was sent to represent Romania abroad only for a little while, and so on. I want to linger a bit on the repertoire promoted by Silvia Șerbescu, because I think it best defines her artistic beliefs. Silvia Șerbescu took on the extremely important mission of always exploring new repertoires and of educating the public to do the same. She brought seven great opuses from all over Europe, and was the first to perform them on Romanian stages: Rhapsody on a Theme of Paganini by Rachmaninoff, Concertos No. 2 and 3 by Prokofiev, the Suite Nights in the Gardens of Spain by Manuel de Falla, the suite Iberia by Albeniz, Indian Fantasy by Busoni, Toccata by Ottorino Respighi, the Piano Concerto for the Left Hand by Ravel and all of Debussy's Preludes, which she presented on the centenary of his birth, in 1962. Lavinia Coman puts together the pianist's repertoire in a list and just a glance at it can tell us much about the path chosen by Silvia Șerbescu. The baroque is present through some works by Bach, then the famous Piano Concert No. 5 and three sonatas by Beethoven (Haydn and Mozart missing), and starting with the Romantic period, the list extends more and more, the biggest section being dedicated to the 20th century. In contrast to what's happening today, these works were regularly performed by every philharmonic in the country. Finally, I would say that Lavinia Coman's approach is very well organized, systematic and equally emotional, characterized by strong affective accents. These come, firstly, from the author being a former student of Silvia Șerbescu. Additionally, Lavinia Coman had the chance to fill some gaps by talking directly to her subject's daughter, Liana Șerbescu, a piano player as well. All these recommend the book 'Silvia Șerbescu - Our First Pianist' as a primary source of information concerning the life and career of the piano player Silvia Șerbescu and, at the same time, as a beautifully told story of Romanian cultural life from the first half of the past century.